Friday November 9th, a beautiful sunny day in Durban, this was the perfect setting for the 17th Annual ABI Charity Golf day and IkamvaYouth was the beneficiary. The IkamvaYouth team (Thabisile Seme ; KZN Regional coordinator, S’bonelo Cele; Umlazi Branch coordinator and N’thabiseng Zwane; Umlazi Branch Assistant), accompanied by 5 learners from the Umlazi branch arrived at the Mt Edgecombe Country estate at 10am.For the day, we were looking after the players and ensuring everyone is properly refreshed. With the sun out, the golf course was great to play on, the players seemed to be having a good timeuntil around 3pm when the rain came down. Most of the contestants were able to finish the 18 hole course in time. By 5pm everyone was freshening up in preparation for the prize-giving dinner. The dinner commenced at 6pm, and guests were welcomed by Norman Reilly, ABI national events manager. The programme included announcing the winners (from last to first place); handing over of the cheque; and auction which raised a further R4000 for IkamvaYouth. S’bonelo Cele had the honour of receiving the cheque for R50 000 on behalf of IkamvaYouth. The excitement from the IkamvaYouth team was very evident. 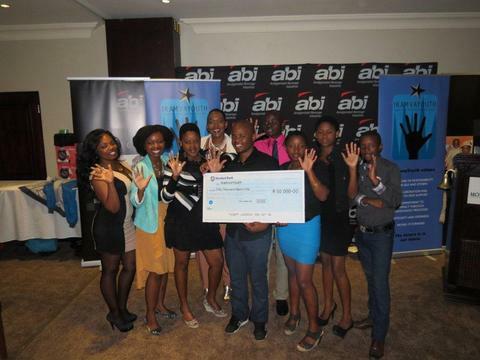 We would like to extend our gratitude to ABI for their massive support, as well as all the companies that participated and ensured a successful event, which raised much needed funds for the Umlazi branch. IkamvaYouth has tried, tested and developed an effective model for addressing South Africa’s education crisis, and ‘it is working!’ We are now in five provinces, and receive countless requests from communities across the country to replicate the model. We are now gearing up to respond to these calls, and to do this we need your help. Reflecting on the great impact IkamvaYouth has had on the lives of South African township youths over the past nine years is a hopeful and inspiring exercise. More and more learners are accessing free tutoring and homework assistance services, and reaping the rewards. Over 77% of Ikamvanites have, since 2005, accessed the post-school opportunities they need to pull themselves and their families out of poverty. 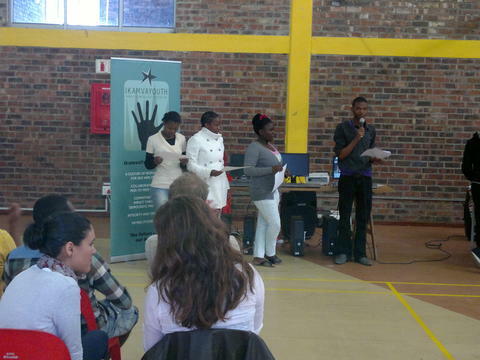 And three out of five matriculating learners return to the organisation as volunteer tutors. IkamvaYouth is on a path to ensure all children in South Africa who enrol in school successfully complete grade 12 or its equivalent, access post-school opportunities, and have a dignified living four years after matriculating. We acknowledge the great role of our partners and funders in making this possible, having learnt the crucial role of parents, communities, companies, other non-profits, government departments, schools and tertiary institutions. IkamvaYouth’s greatest benefactors are the volunteer tutors and mentors, who in 2013 will provide over 8 million rands’ worth of after-school support. We’re now calling for financial donations from individuals to help us dramatically boost our impact. By investing in today’s learners, you’re also investing in the tutors for the following years’ learners. IkamvaYouth is participating in the Global Giving Winter Open Challenge 2012, an opportunity that could land us a permanent spot on the Global Giving Website (www.globalgiving.org), an online giving platform for NGOs that will enable us to access donations from all over the world. The challenge is to raise at least $5000 (about ZAR45, 000), from at least 40 different donors; between 26thNovember and 31st December 2012. Give a life-changing gift this festive season, and empower the township youths of South Africa through education, replicating the IkamvaYouth model across the country. We can achieve a lot with any amount you can give. You can also make a big difference by sharing the challenge with others. Click here to donate via creditcard, PayPal or gift card. To find out more about IkamvaYouth, see www.ikamvayouth.org. 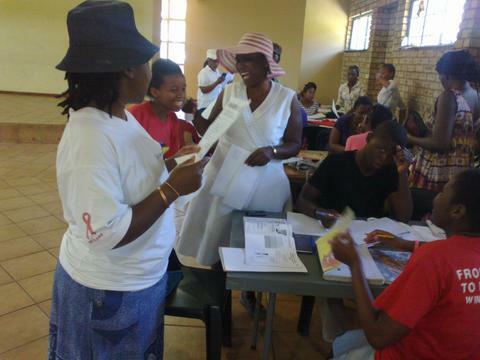 Saturday 24 November was a day of fun and celebration at the Nyanga branch. 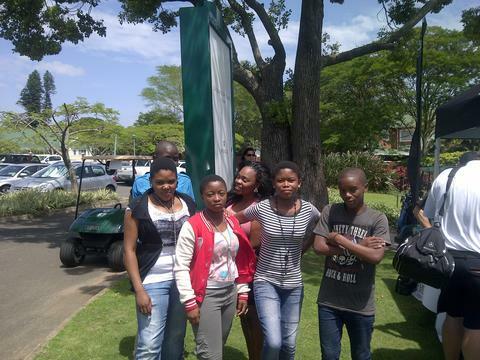 Nyanganites had their year end and prize giving ceremony at Zolani Centre. The prize giving is when learners get acknowledged for, and celebrate their commitment to their own education, as evidenced by their presence in the program at the end of the year. All the learners received certificates of attendance and some learners received recognition for various achievements such as leadership and improvement in school results. 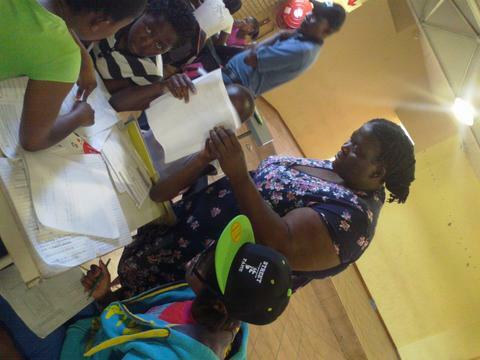 Our volunteers also received certificates for their tireless efforts, helping the learners with their school work. Four learners walked away with computers, generously donated by Capitec bank. These learners were the learner of the year, voted for by tutors; the best attendance overall, most improved learner overall and most improved learner in Grade 12. 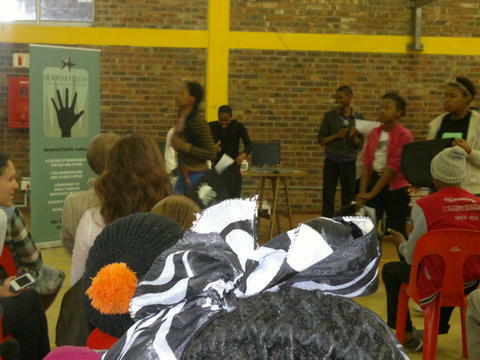 The function was well attended by Nyanganites, their families and friends, IY partners and IYstaff from the Western Cape. A total of 104 certificates and 38 prizes were issued on the day and the learners were excited to be the centre of all this attention. We would like to thank all our partners and supporters, notably Capitec bank, CWD, EPRI, Habonim Dror, HIP2B2, Ikapadata, Numeric, Reel Lives, SACTWU, and The Sozo Foundation. The future is in all our hands. 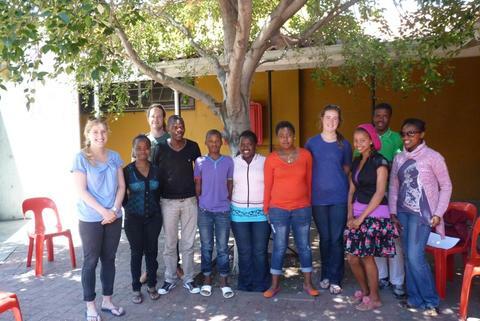 Nyanga learners added a green element to IY values as they participated in an environmental workshop this month. On the 17th of November, ERM’s Andreas Stoll came to help Nyanga branch with the official launch of the Nyanga Green Team. The morning started off with a discussion of the environment and Nyanganites were up to the task; pointing out many things in their environments and lifestyles that are not environment-friendly. At the end of the session, Nyanganites answered the question of what this knowledge means for them. The Green Team, comprised largely of our Grade 8learners, met together and proposed the first project they shall run at the branch, which is s paper recycling project. We are excited as Nyanga continues to soar to even greener heights. 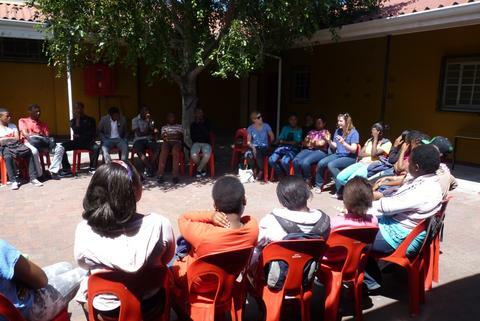 On the 17th November Ivory Park Branch hosted its 3rd Parents Meeting at its branch. This event marked the official establishment of a parent representative for the branch committee. Two parents volunteered their time and commitment to represent parents at the committee. There was a huge turnout from the parents and a total number of 61 parents attended. The total number includes parents of newly recruited learners and this gave parents an overview of what IkamvaYouth is all about. 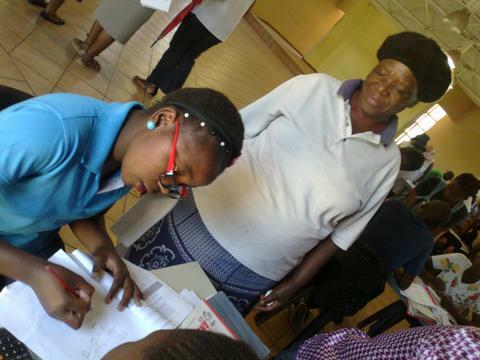 Parents shared their satisfaction and were lost for words in giving thanks to Ikamva for the difference they see in the learner’s reports. In addition, a parent shared the difference in behaviour from her son who has now gone off the streets as a result of the programme because he now has something constructive to do with his time. Another parent shared the significant improvement in his two daughter’s marks, which have now improved and expressed amazement in this regard. This went to show the impact Ikamva has on the learners, not only educationally but also psychosocially and it has bought the IY team at Ivory Park much pleasure in hearing such testimonials directly from parents. We wish to express our gratitude to all the parents who attended and those who excused themselves in advance for working together to make the branch work and working together for the learner’s future. We look forward to a fruitful relationship with the parents.